The concert begins when a ten-foot cylinder slithers onto the stage and implodes, and before long the entire audience is playing catch with gigantic inflatable props! 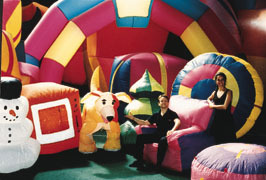 The big blow-up shapes shimmer, balloon, deflate and bounce in a rainbow of colors. Fred Garbo and Daielma Santos inhabit this enchanting world with tremendous aplomb and skill. Suddenly, the globulating red cube takes on a life of its own, rolling, gliding, tumbling in synch to the music, right up to the edge of the stage. The audience gasps, and the big block teeters dramatically on the brink, quaking and bulging and changing shape, then amazing everybody with a hilarious exit. Now the lovely ballerina dances a can-can, but her skirt starts to grow longer and longer, becomming a ball gown, then a balloon engulfing her, finally spiriting her away. Fast-paced, energetic, universally engaging and theatrically clever, Garbo and Santos mesmerize their audience with imaginative imagery and artistic foolishness. Video snipets of the show!